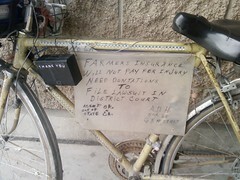 Some recent pix – click one to see it full-size. 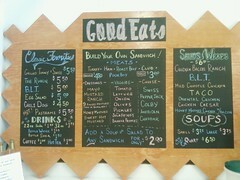 The folks at Good Eats have expanded AND re-designed their menu! 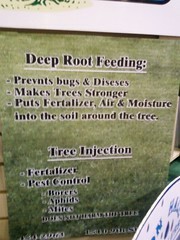 Seen at the Home & Garden Show last weekend. Spot the errors! *OMG* I hope that is not a sign for Ron Hall sprinklers! He was a teacher! Harley Rider, with all due respect, perhaps that is why they didn’t use you. Sign Pro was Ron Hall’s sign company for many years. Look in your files. You have his logo’s, his Rain Bug, his Skiers Edge stuff. You should have several previous home show signs. Very importantly, you have his little American flags. Those little flags are why he stopped using Sign Pro. Familiarize yourself with his graphics, then go make a sales call. Talk to Steve, Ann or Ron. Promise exceptional customer service, and practice it. Offer to set up the Scotts Lawn Care logo gratis if he gives you a chance to prove you can do his work. When the current owners bought the business, they lost the confidence of many customers. Gain it back. You lost many good customers over customer service. There are many businesses out there that are not happy with their Sign Co. because of customer service. You have to prove to them that you have excellent customer service, if you do. Wow – I had no idea. I’ve only been here since August, but will definitely look into this. We have a completely new staff here, and customer service is our greatest priority. We will definitely be making a visit. Thanks so very much for the heads-up! We did the homework and found out that it definitely wasn’t the current owners of Sign Pro who upset Mr. Hall. We’re certainly glad of that!